Switzerland's Vulcain has unveiled its latest piece, the Nautical Cricket 1970 Heritage Watch. A reproduction of the original 1970 release, the 2013 edition retains the design's hesalite crystal and signature Cricket caliber alongside a 42mm 316 L steel case measuring 17.6 mm thick. 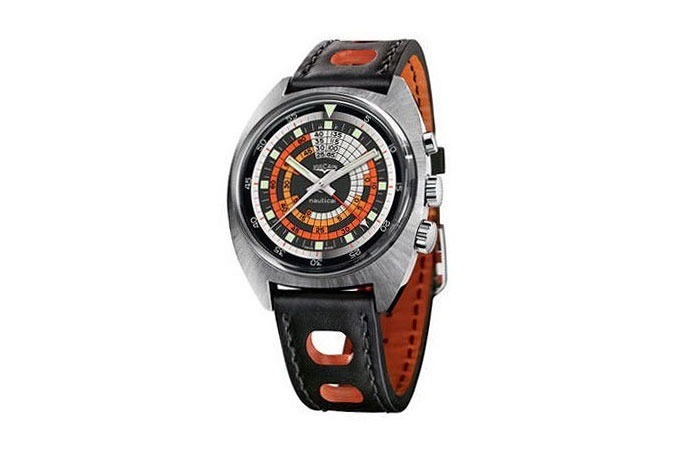 It is water resistant up to 300 meters, and comes with an orange inner rings on the face to calculate decompression times when diving and comes with a matching black and orange strap.